Almost baked the dog yesterday when I took a trip to the other side of the Continental Divide, where I promptly got lost and spent two extra hours driving around areas with which I’m completely familiar. It may have been creeping old age, or distraction, or the rain. It rained, and rained, and rained. Driving around Breckenridge, having missed my nephew’s wedding by two hours, it was so cool and so rainy I had to have the heater on in the car. Came home, pretty frustrated (understatement; I don’t get lost; I drove in Friday night rush-hour traffic from La Guardia to Bryn Mawr without taking one wrong turn), and it was so hot in the house I had to get the dog outside and soak him with the hose. I don’t have air conditioning in the house. (Or a dishwasher, or a TV larger than 19 inches.) My excuse was that if we had air conditioning my wife would have never left the house and all the windows would have to be shut, which was, and is, something I can’t do. I like fresh air, even if it’s hot. Border collies, on the other hand,would prefer air conditioning, and Chess probably would have loved the cool, rainy air on the other side of the Divide, though not the intense lightning and thunder that accompanied it. I also don’t have an irrigation system. A lot of visitors are taken aback by this, but having a garden full of flowers that are only possible because of the existence of a system or a device is not for me. Hence the need for reminders, as in the previous post. I prefer recreational watering to necessary watering. This means a lot fewer flowers at this time of year, that my garden doesn’t look like anyone else’s (horrors), and that when I do water, it’s for what I think are fairly good reasons. Like being able to grow crinums in the tiny garden by the front window. To make it up to the dog for leaving him in the house for so long, I let him take an extra one percent of space on the bed last night (leaving me with about five percent), so he could soak up as much cool air from the fans as possible. He stayed in bed until nine this morning, upside down, legs in the air, hair fluttering in the breeze. 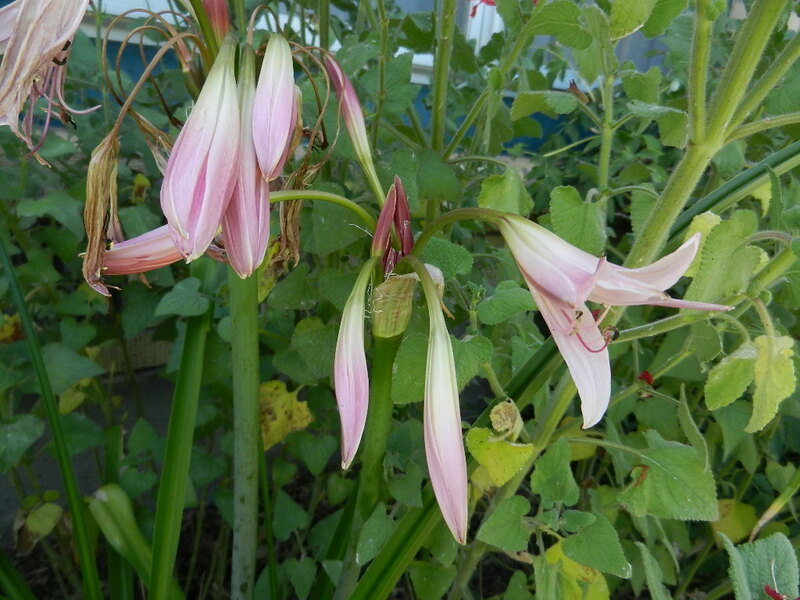 This entry was posted in Uncategorized and tagged crinum. Bookmark the permalink. Why thank you so much. I’ll have to figure out how this works. I don’t look at very many blogs; maybe I should. I can’t think of seven facts about me that no one knows. Non-facts, sure …. Bob, I was a bit overwhelmed by the process of accepting, but did, indeed, found some great blogs to look at while searching for 10. As to the random facts: with your prolific mind, I’m guessing once you get to playing with the notion, bits of random facts will go off like popcorn. Have some fun!